I’ve gone and given your little trees and smelly-wee spears a little veg-jazzle and made them next level. 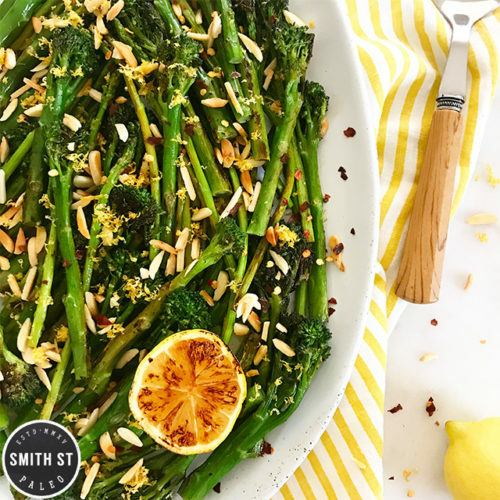 Nothing difficult, just a few little pantry staples sprinkled on top is all you need to make them look and taste all restauranty and get everyone a bit more interested in eating their greens. Heat a fry pan over low heat and dry roast the almonds. Once toasted, remove from pan and set aside. Zest the lemon, and set zest aside for later. Steam or blanch the broccolini until just cooked. Drain. Heat a little olive oil in the fry pan over medium heat and fry off the baby asparagus for a couple of minutes until a little charred, but still al dente. Remove from pan. Heat a little more of the oil, and do the same with the broccolini. When the broccolini is nicely browned in a few places put the asparagus back in the pan to heat through. Squeeze over the juice of the lemon juice and toss through the vegetables. Plate up the greens, sprinkle over the toasted nuts, the lemon zest and the chilli flakes.